For visual and audible alarms in the event of accumulations of electrically conductive liquids such as rainwater, tap water, fresh water, waste water, cooling water and heating water. Alarm unit in wall mounting housing for the detection of even the smallest amounts of water caused by, for example, backflow due to clogged water pipes, water ingress from outdoors, broken pipes or failure of a waste water pump. WWG1 consists of a control unit with visual/audible alarm, Test and Acknowledge buttons, two relay outputs as well as a special floor probe. The probe is mounted at the lowest point of the object to be monitored. The alarm is triggered when the probe comes into contact with liquid. The audible alarm can be muted with the Acknowledge button. The visual alarm is cleared once the leak has been removed. The Test button allows you to simulate an alarm condition in order to perform a function check. The two voltage-free relay contacts are provided for connection of additional external alarm equipment or alarm units. One relay can be acknowledged (e.g. for an external horn), the other relay cannot (e.g. for an external lamp, a solenoid valve, a pump). The alarm units are suitable for panel mounting with a mounting frame. A sealing kit (IP 54) is available for rough application conditions. Alarm units with the EnOcean-ready label can be integrated into your existing building automation systems at a later point in time. To do so, plug the EnOcean® wireless module into the EnOcean® interface (PCB of the device). 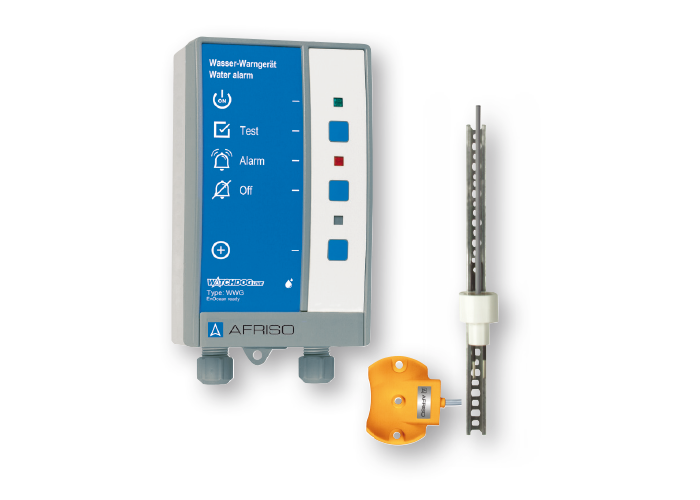 The AFRISOhome gateway in conjunction with additional AFRISO products with EnOcean® wireless technology allow you to configure a whole range of fully customisable, extensible features for the protection of plants and buildings. Water alarm unit WWG 2 like WWG 1, but with height-adjustable wall mounting rail probe. The EnOcean Alliance has established innovative automation solutions for sustainable building-projects – thereby making buildings more energy-efficient, more flexible and more cost-effective. Stay in touch and subscribe to our newsletter.